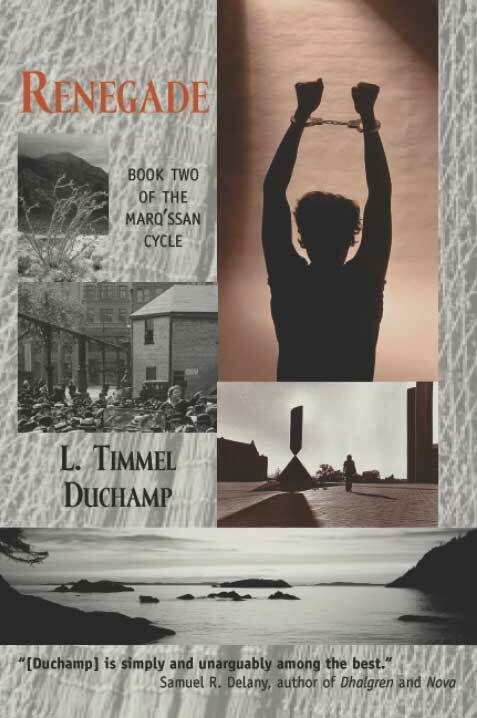 Renegade, the second of the five-novel Marq’ssan Cycle, opens in August 2077 as the Pacific Northwest Free Zone, having survived the first year of its existence, faces both internal and external challenges. The US’s Security Services has deployed a paramilitary covert action team to capture Kay Zeldin, Security’s most wanted renegade, and destabilize the Zone’s civil order. Nevertheless, Kay ventures outside the Free Zone to search for her spouse and dozens of other scientists who have disappeared, traveling through a war-torn American landscape she barely recognizes. When she encounters Security’s formidable Elizabeth Weatherall, each woman risks all she has become in no-holds-barred, mortal combat. Renegade is a passionate novel of love, trust, and betrayal as well as matters of life and death. It poses vital questions about political morality that resonate powerfully with the most significant issues of our day. With this novel, L. Timmel Duchamp, best known for her “provocative,” “daring” short fiction, moves into new territory, mapping largely invisible connections between how humans negotiate the most intimate and the least intimate of relations. "[T]hrough the last two thirds of Renegade, [Duchamp] successfully maintains narrative tension almost solely through the battle of wills between Weatherall and Zeldin. That Duchamp has also done her homework in the series' preparation appears in the scary verisimilitude with which she depicts the intelligence service sub-culture, its methods and their impact upon detainees. Indeed, the work at times reads much like a concentration camp narrative (Levi's Survival in Auschwitz or Solzhenitsyn's One Day in the Life of Ivan Denisovich come to mind) in its lengthy, semi-philosophical passages about self-preservation. While I have certainly been guilty of grousing about and skimming through such long-winded philosophical digressions in other works of SF, with Renegade, I devoured every word of every page." "This second installment of Duchamp's (Alanya to Alanya) projected five-volume saga of postmodern society continues to establish the breakdown of familiar social structures and the transformation of human values from a self-serving model to one that is truly cooperative. Feminist in intent and meticulous in execution, this work of dystopian fiction belongs in most large sf or speculative fiction collections."